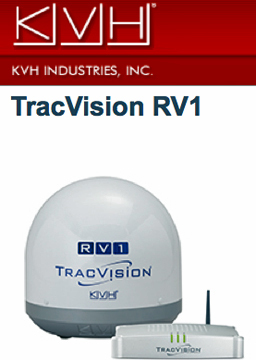 [SatNews] KVH Industries, Inc., (Nasdaq:KVHI) has introduced the TracVision(R) RV1, a powerful and compact stabilized antenna designed to provide superior performance for satellite TV reception from RVs and other vehicles. The new system from KVH is designed to meet the needs of several key markets: RV owners, who want to enjoy their favorite programming no matter where they are parked or traveling; charter bus companies, who want to provide quality TV programming for the athletic teams and travelers they transport; and government and emergency personnel, who need access to breaking news while en route to, or in command of, an emergency scene. Designed for simple, trouble-free operation, the 32 cm (12.5 inch) TracVision RV1 enables reception of satellite TV from moving vehicles by using a motorized antenna to constantly track orbiting satellites. This tracking ability is coupled with fast acquisition capability to facilitate immediate reception of television programming, whether the vehicle is in motion or stationary. RV1's single-cable design - just one cable instead of separate coax and power cables - addresses the need for fast and easy installation. DVB-S2 technology ensures compatibility with current and future Ku-band satellite services. "The TracVision RV1 provides an unparalleled combination of high performance and ease of use for anyone wanting in-motion satellite TV programming," said Martin Kits van Heyningen, KVH's chief executive officer. "It doesn't get any easier than a single-cable installation, so our customers can quickly start enjoying TV entertainment on the road."